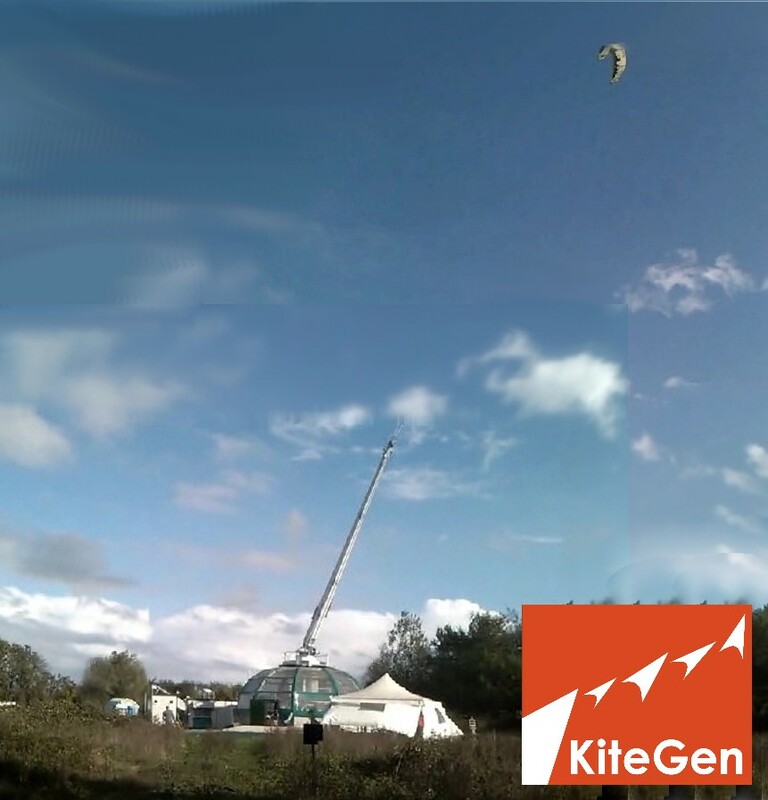 KiteGen an ambitious energy technology, or an unavoidable enterprise? The long awaited baseload wind power! Spain is the second European country in total installed wind capacity after Germany. Spanish utilities deployed a total of 23 GW of wind power until the end of 2014 but no new installations have been made in the year 2015; as the 2015 production data was 48 TWh, an astounding (for wind power) 2087 hours capacity factor was performed (this figure for Germany is as low as 1650 h). Spain is a significant country in terms of both wind distribution and installed wind power. Moreover, the complete hourly wind production data in Spain for 2015 was collected and made available. Thus, we choose it as a convenient “case study” for a comparative analysis of wind power production between traditional wind turbines and the KiteGen technology for high altitude wind exploitation. The diagram in Figure 1 shows the actual energy produced in each 1-hour time interval, in the course of the year 2015, by all wind turbines installed in Spain. This is equivalent to the time behavior of the effective electric power, averaged over the same time span. The reading is at the network input, that is net of all production efficiencies. The recording shows a peak of 17436 MW on January 29th and a minimum of 234 MW on January 8th. Now, we figure out to replace all installed wind turbines in Spain with KiteGen farms based on KiteGen Stem machines of 3MW nominal power each, thus considering the current wind turbine installations as our site certification anemometers to forecast the KiteGen production. Of course, we assume equal conditions for both technologies (same wind and machine distribution, same nominal power installed, same machine-stop hours for maintenance, and so forth). Finally, we impose to limit the maximum power for KiteGen farms to the same power peak recorded in the year by the wind turbines. The latter is a very conservative assumption that we keep to be always on the safe side for our estimate (the theoretical limit would be the nominal installed power of 23 GW that is much higher than the imposed one). - in order to respect the constraint, chosen with the first assumption above, KiteGen machines are bound to work, at the most, at the maximum power exhibited by the Spanish wind turbines in 2015. This auto-imposed limit results in energy production of the KiteGen farms that is most of the time below its potential limit as calculated in the above steps. Therefore, all the maxima of the estimated KiteGen production are clipped and the corresponding curve in the next plot shows a flat profile with only downward peaks during the wind calm periods. The picture in Figure 3 compares the power delivered starting from the same source (the wind) but by means of different technologies: traditional wind turbines (red curve) vs KiteGen (blue curve). The data for the wind turbines refer to year 2015 and come from measurements. The estimates for KiteGen are obtained from the same wind data and the assumptions reported in the text. If we move up and fly at 1500m for instance, then the power available from the wind becomes 8 times greater than that at 100m. We proceed with the same assumptions and power limit as before, and we obtain an even flatter profile, which approaches the condition of production at constant power, as shown by the next plot. Figure 4 is the same as Figure 3, but with the kites flying at an average height of 1500m, where the wind blows faster and carries 8 times as much power than at 100m height (turbine axis typical height). 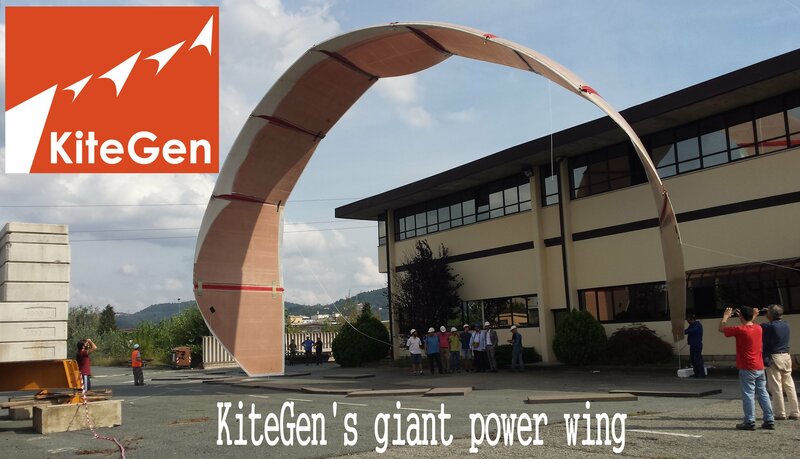 Due to the great power potential of the KiteGen concept, combined with the choice of limiting the power during generation, KiteGen allows to approach a constant power production, even starting from an energy source, the wind, that is typically discontinuous at ground level. Of course, wind calm, in some locations, means production decrease, derived as the difference between the power target (that is the limit imposed to the maximum power) and the estimated KiteGen production. Aiming at reaching a constant power supply, wind power should be integrated by other energy sources: in the worst case, there is an energy lack of less than 100GWh, at a maximum rate of 16GW. Of course, production gets even more regular if we allow the kites to fly 1500m high, as it can be seen in the next plot. Figure 5 depicts a scenario with the kites flying at 1500m height from ground. Again, energy accumulation and power release is much less demanding if flying at 1500m. The same is true for the plots that follow, namely the zoom of the worst case, the highest peak of Figure 5. Figure 7 assumes the lower advantage of KiteGen vs variable speed wind turbines than that assumed in Figure 6, in which synchronous wind turbines are the reference. In this case study, we have 23 GW of KiteGen generators installed nominal power. We have shown that the 18 GW peak power output (same of the wind turbines) of these generation plants would be quite steady, except for some short exceptional “wind calm” periods. These events can be forecasted with good accuracy but, in order to find possible grid issues due to the consequent power shortage, it is necessary to determine both the maximum power lack and its duration. In the analysed time frame, the worst wind shortage lasts for 16 hours and reduces the power output by 10 GW (see fig.5). Figure 8 – Spanish grid management scenario with 23 GW KiteGen installed nominal power. The real power demand curve for a significant day of the 2014 calendar is shown. The picture depicts a sample energy mix scenario for a typical winter day. The hourly available power generation sources, including KiteGen, fulfill the demand. The meaning of this figure can be better understood if we look at the main characteristics of the Spanish power grid, as reported in http://www.ree.es/sites/default/files/downloadable/preliminary_report_2014.pdf. The Spanish baseload is covered by nuclear (7.8 GW) and coal (11 GW) power plants that produce 57 and 44 TWh per year, respectively. Thermal renewables (biomass/biogas 1 GW and solar thermal 2.3 GW) produce more than 10 TWh. Mid merit plants, like gas combined cycle and cogenerators, add 34 GW for a total production of 52 TWh: these plants normally act as reserve because the average plant utilization is just 18%. Total hydro power amounts to 20 GW (of which about 6 GW have a pumping facility) for a total production of 42.5 TWh (actually part of this, belonging to the fluent hydro plants, must be accounted in the baseload). Wind (22 GW) and Solar PV (4.4 GW) score 51 TWh and 7.8 TWh, respectively. Spain has also a huge rotating engine generation capacity, mainly located on the main islands (Baleares and Canarias). This 4 GW power capacity produces about 6.6 TWh. All these have a net production of about 254 TWh. 5.4 TWh are used for pumped storage and about 5 TWh are exported, thus the net grid demand is 243.5 TWh. The power demand peak is near 40GW while the minimum demand is in a range from 20 GW to 25GW, say an average of 22GW. This means a baseload energy demand of about 190 TWh. In the KiteGen 23 GW scenario, the new source would produce about 150 TWh, to be considered as baseload power. The Spanish nuclear power plants date from 1983 to 1988. The older 3 plants, of cumulative power 5 GW, are more than 30 years old. There are also more than 3 GW of old coal plants aged more than 30 years. Thus, the baseload energy coverage would be assured also if the oldest coal and nuclear plant were shut down. During the peak hours, gas turbines, cogenerators, diesel engines, solar and hydro power plants are able to fulfil the demand curve. * Turning on all the gas turbine, diesel engine and hydro spare capacity and importing from France, Portugal and Morocco. During the worst event, the baseload misses 16 GW of KiteGen power at the 40 GW peak hour (the peak is 16 GW above the baseload), so the grid would require additional 32 GW from the reserve sources, the latter being the 34 GW currently under-exploited gas capacity and the 6 GW double basin hydro. This can be accepted easily, also considering that the current 22 GW windmill production has similar and more frequent power lacks and the Spanish grid normally faces the issue by increasing the double basin hydro power. * Following the suggestion of many “smart grid experts” calling for a massive use of high performance battery packs to support wind and solar power. In the depicted scenario, a battery system able to store 160 GWh and react to the wind calm would cost about 190 G$ (1200$/kWh). A quite high cost even for a developed country. * Removing the 1500 m altitude limit constraint. 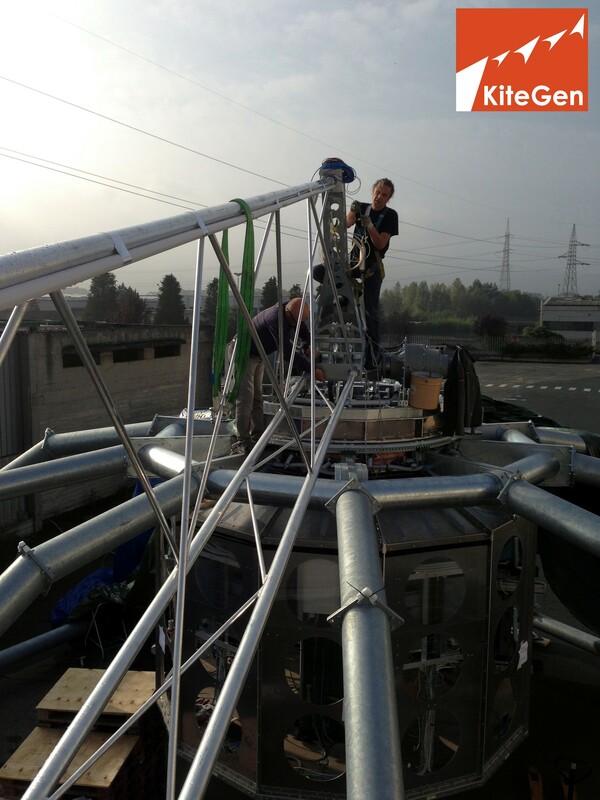 This allows the KiteGen generators to get higher in order to reach spots of stronger winds. * Exploiting more high altitude wind resources to desalinate the seawater and/or produce hydrogen in order to use it as feedstock for the synthesis of fuel, fertilizer and so on. The additional baseload power demand due to these continuous processes can be interrupted when the wind calm events happen, helping to stabilise the grid. These events have been estimated to last a few hundreds of hours a year (see fig.5).